You've got to be kidding!! This is absolutely the best putter I've ever owned. That white, gnarly insert does really roll the ball straight and true. This thing blows the others all away.... even on the wet, punched and sanded greens here in Northern New England in the late fall. The putting surface doesn't affect your put as much as with other putters. It took a few rounds to adapt to the speed and how it rolls the ball but once you groove it, 6' and in seems almost automatic ! Just a shame that MacGregor's equipment is never given the consideration it once had for making excellent golf equipment. I tried this one out almost by accident, but decided to buy it after holing 10 straight putts on the practice green....all from different holes and distances. Took it to the course and it performed well....took a bit of getting used to with the urethane insert as I was used to a harder aluminum insert. That soon passed and I found the "feel" for the urethane insert.....just have to hit it a bit harder. At $50 it was abargain! The MacGregor Lakewood is one of the Distance Correcting Technology putters developed by Bobby Grace and patented by MacGregor. It really works. The polymer face is livelier on the heel and toe edges, so putts hit off-center get more rebound energy and travel the same distance as a putt struck in the center of the clubface. Once the golfer calibrates his putting stroke to the right distance, then a sloppy hit has a much better chance of getting to hole high. If not in the hole, then certainly closer for the next putt. The Lakewood is a familiar shape first popularized by the Ping B60, and copied by Cameron, Cleveland, Ray Cook, Northwestern, Yes!, and a host of others. Each has their selling points, but none of the others has the distance correcting technology insert. While they may work with roll, backweighting, and alignment aids, in my testing of dozens of this B60-type design the MacGregor Lakewood offers the most compelling feature - the DCT. MacGregor has been licensed by Golfsmith, and Mr Grace has re-formed his own putter company, so Lakewoods are not in production and are hard to find. They have a no-glare finish, a Golf Pride high-tech grip with a True Temper shaft. Some are fluted. The putter has a plumber's hosel that can be adjusted for lie and loft, and the weight is good for both 34- and 35-inch models. It naturally has about a 20-30 degree toe hang, and hence is a good choice for both pendulum and arc putter paths. Very solid strike with good feedback. Apparently Golfsmith is not marketing these models, and Bobby Grace is not either. It is a patented insert, so no one else can use it without paying MacGregor/Grace for about another 15 years. This is one fantastic putter. I've only had it 3 weeks and already I've knocked about 2 strokes a round off my score. It has great weight and feel. The sweet spot is amazing-it's very hard to hit off line. I like the metal head better than the polymer but other might disagree. You can buy it online at Ebay for under $70. 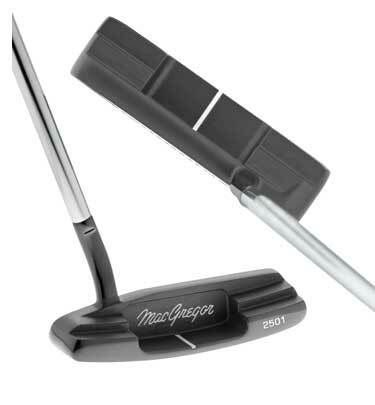 I purchased both the DCT Face Off, and the DCT Sarasota putters as I am a huge fan of Macgregor products. First the DCT Face Off putter. This putter is much bigger than I had imagined it to be. Alignment is fairly easy, and the weight is good. The quality is very good (milling, grip etc). If you like a bigger putter head this could be the putter for you. The DCT Sarasota has an excellent feel and swingweight. It is a heavier head and helps keep the shoulders quiet during the putting stroke. Alignment is quite easy and I had the distance control down after the first round. This is an excellent putter in my opinion, especially for around $35 brand new. It comes with a nice magnetic head cover as well. The DCT technology is very interesting and Macgregor has a video about it on their website. Hats off to Macgregor on this one, solid product in my opinion.